More frontline police officers could soon be carrying 50,000-volt Taser stun guns under government plans. Tasers - which temporarily disable a suspect - can be used only by firearms officers confronted by an armed person. The Home Secretary John Reid made the announcement at the Police Federation of England and Wales' conference. Amnesty International has criticised the move, which would also change the circumstances in which officers can deploy Tasers. The group claims the devices can be lethal and wants a public inquiry before their use is extended. Amnesty argues the stun guns have been linked to more than 70 deaths in America and Canada. But in a speech in Blackpool, the home secretary said there would a year-long pilot from September subject to medical approval. The Home Office now wants Tasers to be available to police in specialist units, including tactical support teams and drugs squads. The trial will involve about a quarter of the 43 forces in England and Wales. Officers will also be able to use the stun guns if they face violence or threats, not just if they are confronted by someone with a weapon. Mr Reid told police officers he agreed with Police Federation calls for an expansion of Tasers and recognised the risks they faced. "You deserve our protection," he said. "I want them to be available to other specially trained teams - not just firearms officers - sent in to deal with severe violence or threats of violence. I hope that from September this year we can start a trial." During the last four years, Tasers have become standard police equipment in the UK and have been regarded as a less dangerous alternative to guns. They deliver an electric shock by two barbed darts trailing wires. A total of 3,000 have been issued so far, but only specially trained firearms officers can use them. Armed response vehicles in London also carry the stun gun. 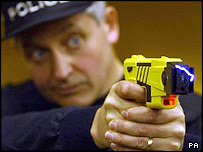 A sub-committee of Britain's Defence Scientific Advisory Council looked at the medical implications of Taser use in 2004. It concluded that the risk of life-threatening or serious injuries from the M26 gun used by police in England and Wales was "very low". Alan Gordon, vice-chairman of the Police Federation, said his members welcomed an expansion of Taser. "If there is a need to use force then in some circumstances it would be better to use a Taser," he said. "It's not fair to compare us with US-style policing. You won't see people tasered for traffic offences. Officers will use it responsibly. At the moment they have a baton and CS gas. "There is no long-term effect with Taser. But if someone is batoned or [gassed] there are long-term effects."